Well been a bit since I posted anything car related but as many people re aware of the HUGE earthquake so I`ve been kept busy. I`m fortunate to be located in the western part of Tokyo rather than the north eastern Tohoku area which was ravaged by the quake and worse, a HUGE tsunami. I was at school serving students some snacks with the other teacher and then all of a sudden the ground started to sway. It was quiet gentle at first but suddenly felt like I was on boat. 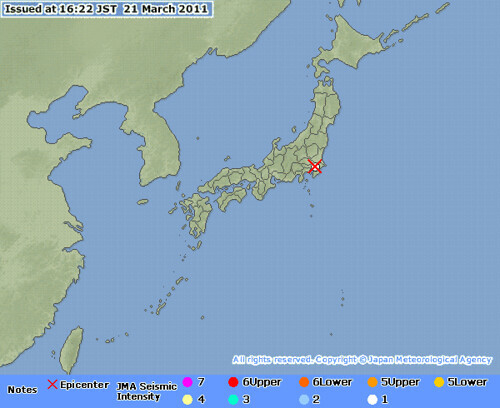 First off I`m located about 300km from the origin of the Tohoku earthquake which tells you the magnitude of this quake. Here is a moderate earthquake. This is the monster I saw M9.0. After seeing what hit, I changed the channel to see the relentless tsunami that was attacking the Tohoku area, fire of a refinery in Chiba, and later the next day the news of the Fukushima reactors. In brief, after the first 2 days people were rushing to get fuel, and other supplies such as non perishable food, toilet paper, water etc. So the panic combined with store stock delays because of fuel shortage / highway closure caused a separate set of problems in the Tokyo area. Tokyo power had also announced scheduled blackouts to reserve power which fuels the panic more, so no batteries, flashlights, or even candles to be found. 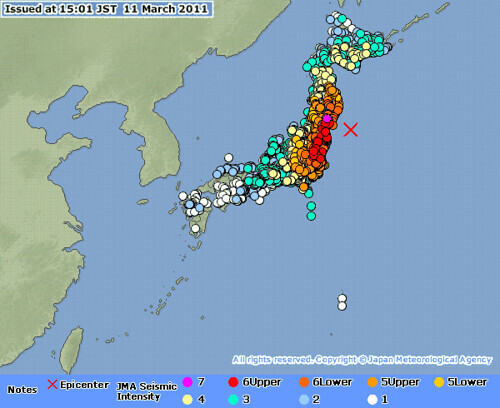 Interestingly enough with all the panic and limited supplies, the Japanese keep a really calm attitude. Oh hey Chad, i deleted my FB, email me man & keep in touch! Thanks for the thoughts ! will keep in touch ! Best keeps the blog going ! !